Blah blah blah resolutions blah. Seems like that’s all anyone talks about this time of year. But the fact of the matter is, there’s nothing magical about January in terms of getting healthy. In fact, it’s harder to make a drastic change mid-winter (when, let’s face it, your body is craving sleep and warm comfort food) than to make gradual changes over time that you can actually sustain. For me, the two major things are exercising almost every day and eating healthy at home since my job often entails lots of eating out, drinking, and treats. But if there’s one thing I’ve learned about myself, it’s that I’m not going to stick with a diet that I don’t enjoy. That’s why one of my big focuses in the past year has been finding super healthy recipes that I absolutely love. Make a list of the most healthy foods and ingredients you should be eating—superfoods, whole grains, spices, etc.—and then see how you can work them into recipes. Everyone’s list is going to be different. For me, I haven’t found anything involving lentils that I enjoy and brown rice is dry and bland when eaten as leftovers. 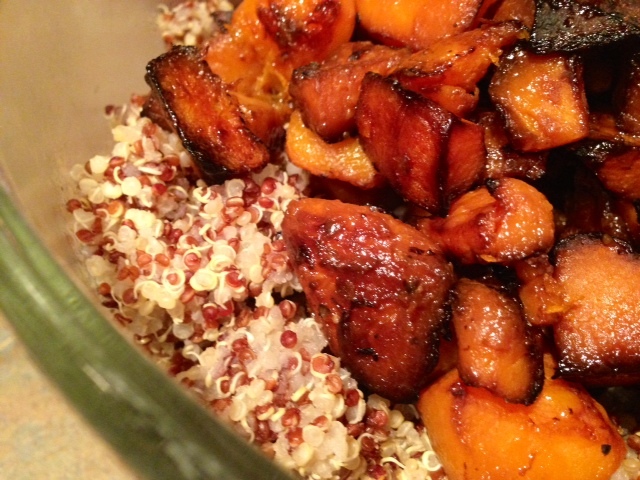 But conversely I’ve found a lot of quinoa and barley recipes that I like and are great to take to work the next day. I love kale, brussels sprouts, all squashes, okra, and spinach, but there is no recipe or list of healthy benefits that can convince me to eat cucumbers, green peppers, or fresh ginger. Once you find ingredients you enjoy, hunt up all sorts of different recipes using them. That’s where this recipe comes in. I’ve found that quinoa salads like this one and my sweet & savory chicken quinoa and quinoa & kale salad with feta & pecans are easy, healthy, filling, and affordable. And that’s quite the combination. 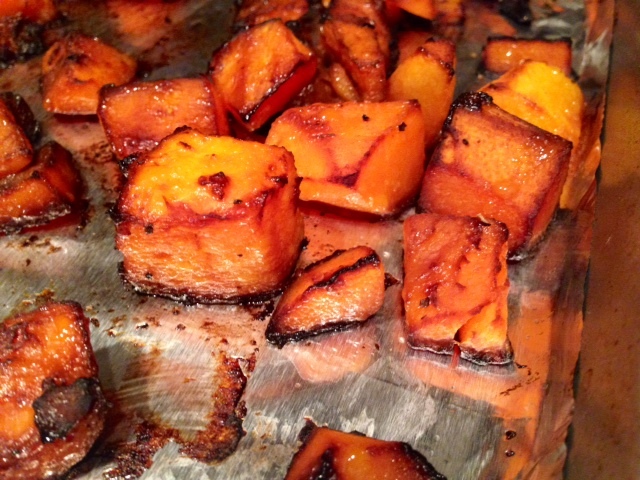 You can roast the butternut squash ahead of time if you want. Preheat the oven to 400 F. Lay foil over a large baking sheet for easy cleanup. Peel and dice the butternut squash (I bought mine that way from Trader Joe’s), then drizzle with olive oil and season with salt and pepper. Toss until squash is well coated. 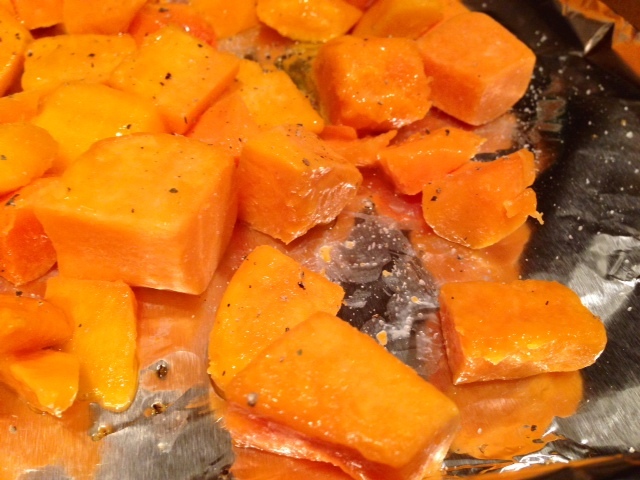 Roast the squash for 20-30 minutes, stirring once, until tender. Keep an eye on them, you don’t want them to burn. 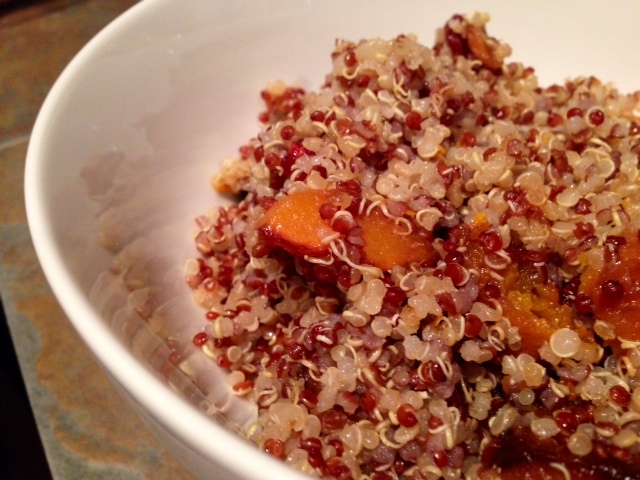 While the butternut squash is roasting, cook the quinoa. 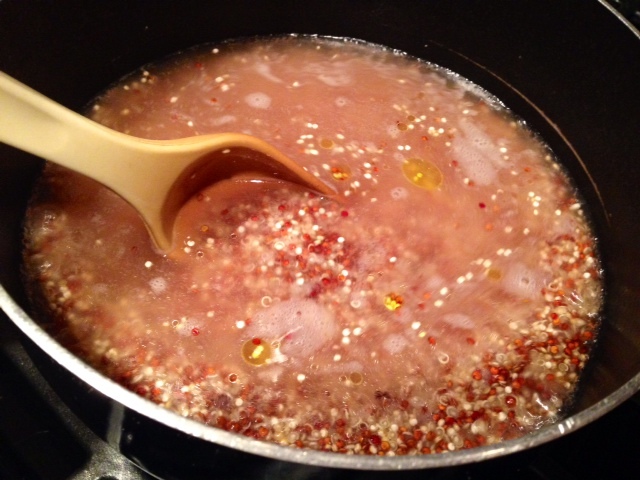 Add the quinoa, water, and salt to a medium saucepan (I throw in a tablespoon or so of olive oil) and bring to a boil over medium heat. Boil for 5 minutes. Turn the heat to low and simmer for about 20 minutes, or until water is absorbed. I just followed the package directions. Remove from heat and fluff with a fork. Let the quinoa cool to room temperature. When you’re ready to assemble everything, make the dressing. 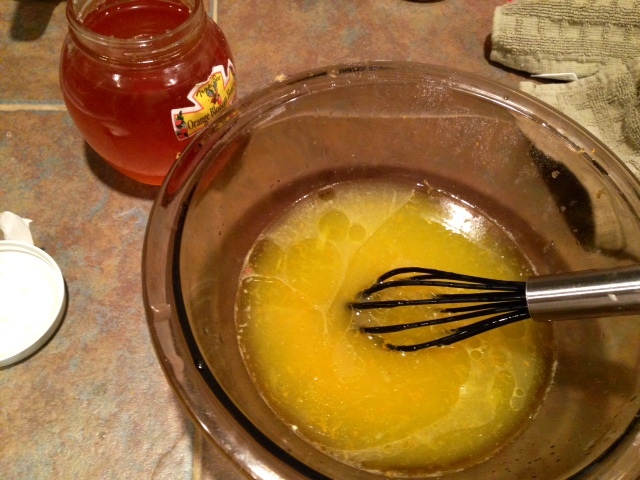 In a medium bowl, whisk together the orange juice, zest, olive oil, and honey. Season with salt and pepper, to taste. 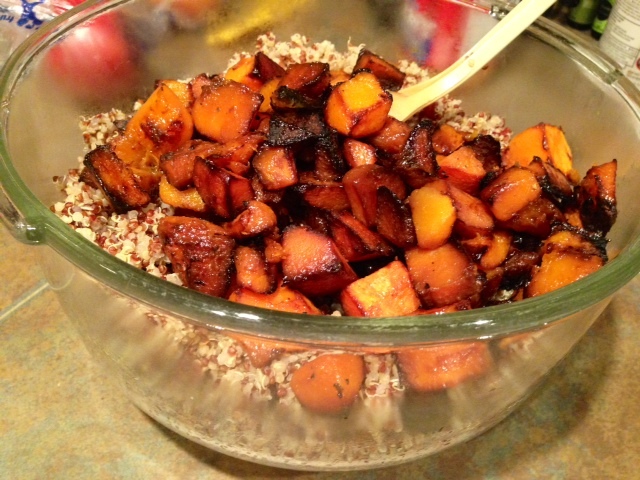 Stir together the quinoa, butternut squash, dried cranberries, and pepitas. I didn’t have pepitas, so I omitted, but you could also substitute sesame seeds, pecans, or whatever your heart desires. Drizzle the dressing over the salad and toss until it’s well-dressed. Season with more salt and pepper if needed. This salad can be served either warm or cold, totally your preference. It stays good in the fridge for several days. 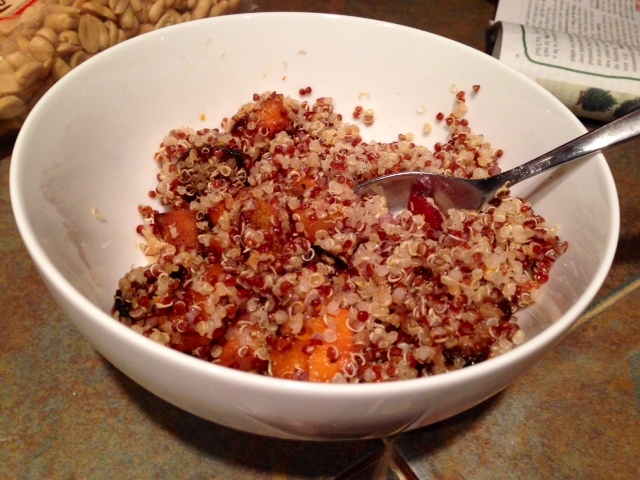 I find it easiest to roast the butternut squash and cook up the quinoa ahead of time (you’ll want the quinoa to cool down a little before making the salad). Preheat the oven to 400 F. Cover a large baking sheet in foil for easier cleanup. Peel and dice the butternut squash if you have a whole one; I bought mine that way from Trader Joe’s because I hate preparing butternut squash. Then drizzle with olive oil and season with salt and pepper, toss to coat. Roast the squash for 20-30 minutes (will depend on your oven and the size of the squash pieces), stirring once, until tender. 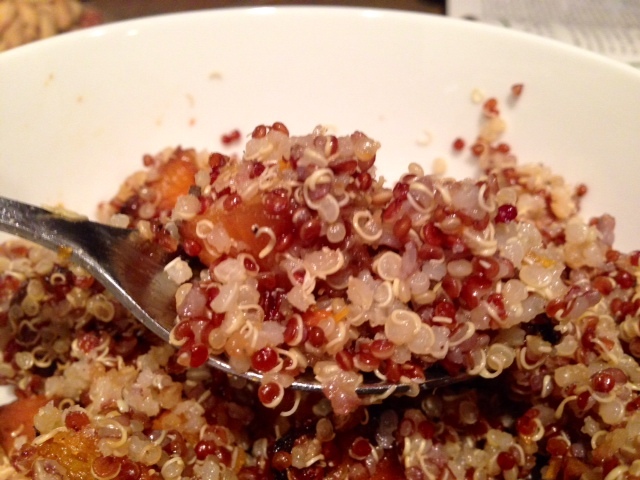 While the butternut squash is roasting, cook the quinoa according to package directions. In a medium saucepan, combine the quinoa, water, and salt (I throw in a tablespoon or so of olive oil) and bring to a boil over medium heat. Boil for 5 minutes. Turn the heat to low and simmer for about 20 minutes, until water is absorbed. Remove from heat and fluff with a fork. Let the quinoa cool to room temperature. When you’re ready to assemble everything, make the dressing. 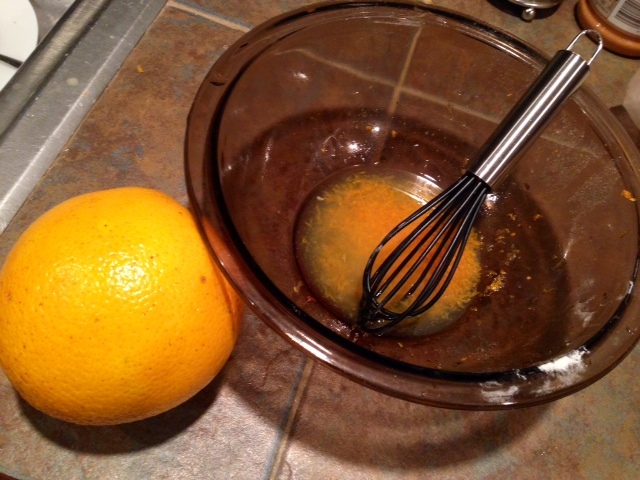 In a medium bowl, whisk together the orange juice, zest, olive oil, and honey and season with salt and pepper to taste. Stir together the quinoa, butternut squash, dried cranberries, and pepitas (I didn’t have pepitas, so I omitted, you could also substitute sesame seeds, pecans, or whatever your heart desires). Drizzle the dressing over the salad and toss until it’s well-dressed. Season with more salt and pepper if needed. Serve warm or cold, whatever your preference; will keep in the fridge for several days. Yum! I have been obsessed with quinoa salads for lunch and have been adding sweet potatoes and a lot of other roast vegetables.